Billy Corgan, frontman for '90s alt-rock group The Smashing Pumpkins, has always clung tight to the feeling he would some day be reunited with the Fender Stratocaster stolen from him years ago. The guitar was snagged from stage during a Saint Andrews Hall gig in Detroit of 1992. The band’s usual road crew had not accompanied them on that particular night. A friend stood in as the only person assisting them, which Corgan says made it easy for someone to swipe the Stratocaster straight from the stage, and walk right out the door. Corgan said no-one ever came forward with a good description of the guy suspected to have taken it. The yellow Stratocaster, which Corgan believes to be a 1974, was used on the band's debut album, Gish (1991). He credits the vanished guitar for the band's specific sound. Because of the way the guitars were manufactured at the time, he says, it created an inconsistency with how they sounded. Corgan says the band played very aggressively at the time, and why he considers the Strat to be the Holy Grail of all his guitars. He says it gave him everything he could ever want in a Strat, but with “more heavy attack to it,” creating what Corgan calls “the Pumpkins sound”. He spent years searching for something that could sound the same. Sometimes he would come close, but he says nothing was ever as perfect. With rewards up to $20,000 for the return of the guitar, with no questions asked, Corgan has seen numerous replicas said to be the real deal. Over the past 27 years none have been authentic, and he would know: he hand-painted it, adding to distinguishing marks such as cigarette burns on the headstock, and the initials that had been carved into it before belonging to him. “I basically took a brush and went like this,” Corgan says, sporadically waving his hand. Fast-forward to a few weeks ago, through a series of chance connections and communications, music executive, Alex Heiche of Sound Royalties, received a call from a friend Will Carter of Nashville based Music Starts Here. Will received a phone call from a friend’s wife, who thought she might possibly have Billy Corgan’s yellow Stratocaster. Beth James of Flushing, Michigan had been visiting family in Detroit about 10-12 years earlier when she stopped at a neighbouring home where an older couple was having a yard sale. James was in the process of converting her basement to an entertainment room. Self-described as having no real knowledge of guitars, something caught her eye - a yellow guitar speckled in paint chippings of blue, red and green. James shelled out $200, and took it home. That’s where it would remain. Untouched, for the next decade. Over the years, friends would comment the guitar was seemingly special, valuable perhaps, so when it came time for James to declutter her home, a friend suggested checking the background of the guitar before getting rid of it. The research turned up an online article about Billy Corgan’s stolen Stratocaster. Article photos showed a guitar with shockingly similar markings to the one Beth had purchased years ago. On the off-chance she did in fact have Corgan’s guitar, she wanted to reach out to let him know. A failed attempt to reach Corgan via Facebook led her to sharing the story with a friend, which led her to Carter and Heiche. Sound Royalties arranged a meet up between Corgan and James on 5 February, during Grammy week at the Sunset Marquis, a hotel popularised among musicians for years, and located just off the Sunset Strip in West Hollywood, California. The location played host for the chance to reconnect Corgan with the guitar that was instrumental to his early musical career and distinct sound. James and her husband were flown in from Michigan, guitar in tow, stored in a borrowed case. Corgan arrived moments later and entered a private patio area where everyone sat waiting in anticipation. He said he would know for sure by holding the guitar, feeling its weight, and looking at his own paintwork up close. “All right, let's take a look,” Corgan said before heading towards the guitar case. James unlatched the locks, as Heiche and Corgan looked on. Corgan says it’s surreal to be reunited with the guitar after so many years, but he always thought it would eventually happen. 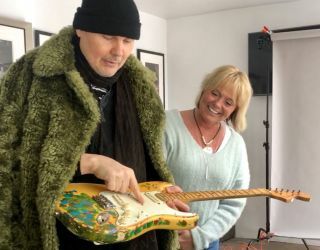 “I always felt it would come back to me, so as upsetting as it was that the guitar was stolen, I always felt it would come back at the right time, and it is actually the right time, so there's something so beautiful about it,” said Corgan. The timing couldn’t be more perfect: Corgan has been in the studio working on a new Smashing Pumpkins album. He says if there’s one thing Pumpkins fans want most, it’s more of that original sound Corgan credits the guitar with creating.